Welcome to this month's post for the Kosher Linkup Challenge. This month's challenge is honey. Since the High Holy Days are coming fast, I thought to share a main course recipe with you, Dear Reader. 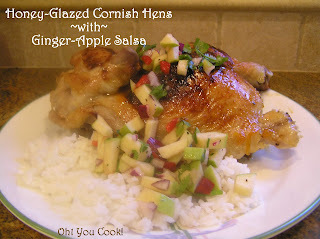 Apples dipped in honey is a traditional Rosh HaShana treat so I used the duo in creating this awesome Cornish hen dish. By the way, did you know that, according to The US Department of Agriculture, Cornish hens are not necessarily Cornish hens? They can be a cross with another chicken breed and still be called Cornish. In any case they usually weight around 2 pounds. But according to that other qualitative source, Empire, kosher Cornish hens are labeled Cornish broilers and can weigh as much as 3 1/2 pounds! So if you use a couple of kosher birds, this recipe makes up to 8 servings, a quarter per. If you find real Cornish hens, then allow an entire half per person so your guests shouldn't starve. After dropping off youngerSon at his college dorm last week, I celebrated consoled myself and theHubby by another attempt at making donuts. Shutterbean has a yummy-looking recipe for chocolate donuts. Actually, dipped in glaze and kissed with toasted coconut, hers are ever-so-more-elegant that they deserved her more formal spelling of doughnuts. Mine weren't, so they are spelled the more casual style. Shutterbean recommends using cooking spray as the greasing agent. Normally, cooking spray gunks up a non-stick pan, at least in my house, so I dabbed olive oil on a paper towel and lubed up 3 mini-donut pans. At 12 minis per pan (don't bother taking off your shoes) that's 36 potential mini-donuts. I missed the part about a yield of 12 minis, as in only one pan's worth. I also missed greasing a few (and by few I mean most) spots here and here. Big mistake, even with a supposed non-stick pan.